Singapore, February 2014 – Women are a source of inspiration and a pillar of strength for one another. 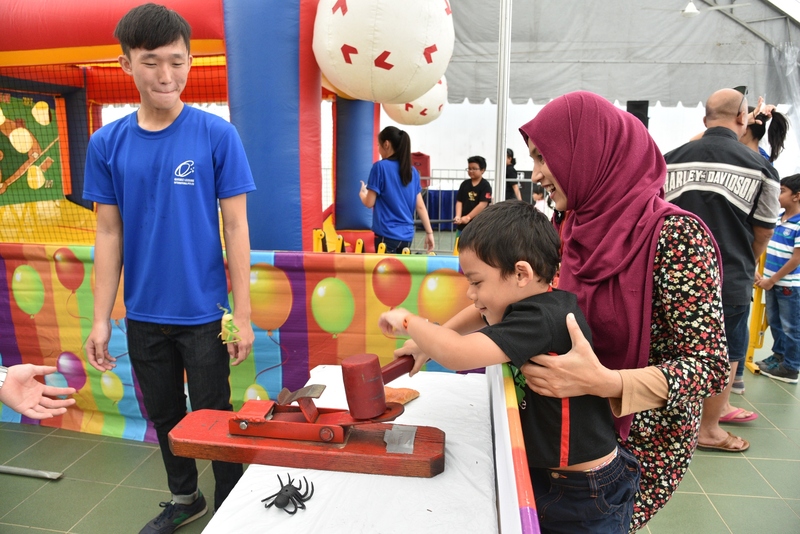 To honour this indissoluble bond, Parkway Parade is celebrating the everyday women with a plethora of activities. In conjunction with this coming International Women’s Day, nominate your woman of influence through the “Celebrating Women App” this February. To add on to the festivity of applauding the spirit of womanhood, get your nails primped at the “Nails For A Cause” event, to be held on Mar 8, where women from all across the island come together to support a worthy cause. The everyday women in our lives, be it your mother, best friend, partner or lady boss, could have made an impact in your life. Nominate that extraordinary woman and share their story on Facebook. 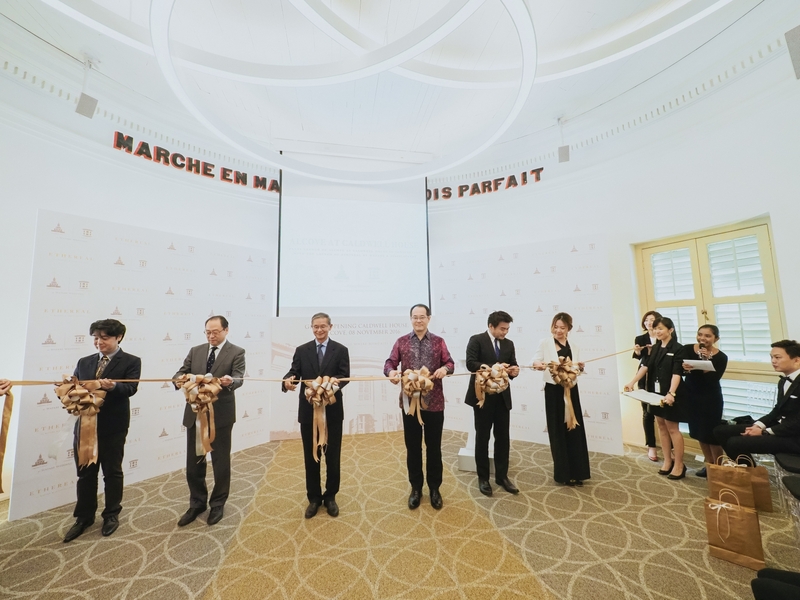 Three female nominees will be selected to grace the opening of the International Women’s Day event at Parkway Parade and be awarded a Destinee Serendipity pendant with chain from Lee Hwa Jewellery, worth $3,366. Get your nails done and make a difference to someone’s life today. In partnership with the Singapore Cancer Society, a beneficiary of cervical cancer, Parkway Parade aims to raise awareness and bring smiles to women everywhere by hosting the largest manicure event “Nails for A Cause” on 8th March, Saturday. All proceeds will go to fundraising to benefit the Singapore Cancer Society. “At Parkway Parade, having been serving families for the past 30 years, we would like to show our appreciation to the mothers, daughters and sisters everywhere. By donating the proceeds we have garnered during our “Nails for a Cause” event to the Singapore Cancer Society, we hope that this would make a difference to someone’s life”, expressed Ms Stephanie Poh, General Manager, Parkway Parade. At Parkway Parade, our vision is to be the preferred shopping destination that delivers meaningful and refreshing experiences for shoppers, fulfilling both their functional needs and emotional aspirations. We strive to create significant value and brand equity for our stakeholders through a strategic tenant-mix, shopper-centric activities and seamless experiences for our discerning shoppers. a relevant range of choices for the families who desire convenience and a meaningful retreat in a refreshing environment. Parkway Parade is owned by Parkway Parade Partnership, managed by Lend Lease Retail Pte Ltd. It is located 8 kilometers to the East of Singapore’s CBD just off the Marine Parade exit on the ECP. Parkway Parade is one of Singapore’s first major and biggest suburban malls. It comprises 7 levels of retail outlets (including basement) with over 270 retailers, 1 level of Medical Centre, a 17-storey office tower atop the retail podium and a car park with 1201 parking bays. Parkway Parade is a mall managed by Lend Lease. Lend Lease is a leading international property and infrastructure group. Listed on the Australian Securities Exchange and with over 16,500 employees worldwide, Lend Lease’s capabilities span the entire property spectrum - development; investment management; project management & construction and asset & property management. Our expertise covers multiple sectors including commercial, life sciences, retail, hospitality, education and industrial. We create innovative and sustainable property solutions, forging partnerships and delivering maximum benefits to clients, investors and communities. Sustainability has always been an integral part of our culture and through design and investment in new technologies; we are delivering the next generation of sustainable property solutions. Safety is our number one priority and Lend Lease is committed to operating Incident & Injury Free wherever we have a presence. For more information about Lend Lease, please visit our website www.lendlease.com. Nominate your most inspiring woman of the year on our Facebook App via the link https://apps.facebook.com/celebratingwomensg and Share it on Facebook for a chance to win. All entries are to be accompanied with a write-up (less than 100 words) and a photo to be submitted on Parkway Parade’s website or Facebook by 28 February midnight. 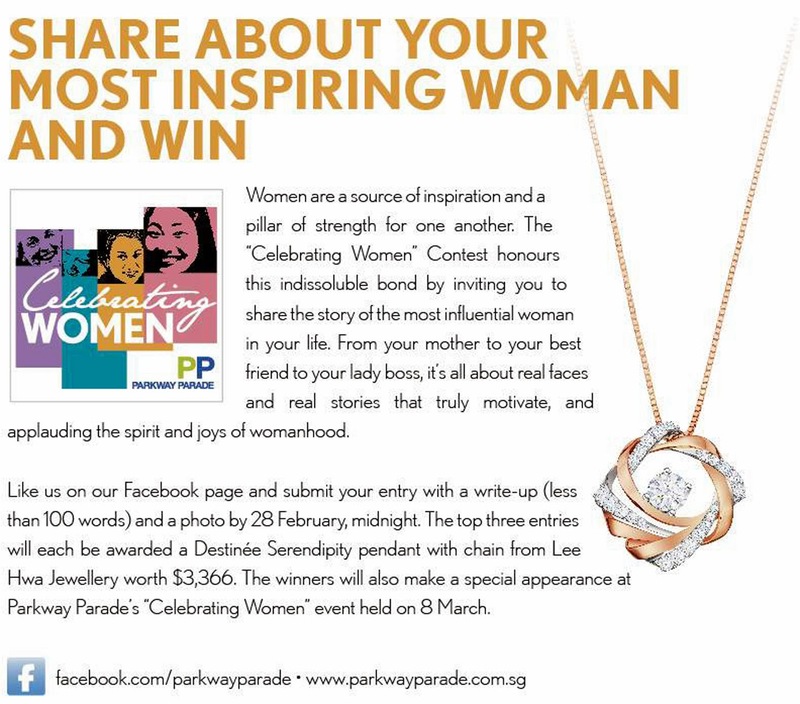 The top three entries will each be awarded Destinee Serendipity pendant with chain from Lee Hwa Jewellery worth $3,366. The final 3 nominees will also make a special appearance at Parkway Parade’s “Celebrating Women” event held on 8 March. Join in the attempt to beat the Guinness World Record of mini-manicures as over 80 professional manicurists paint nails at a speed of 10 minutes each. All proceeds will go to Singapore Cancer Society (The Cervical Cancer Preventive Fund). The organizer will allocate the manicure session respectively and inform participants of the timing by 7 March. Participants will have sign up by 2 Mar and pay $10 (per person) with your Visa or Mastercard card at http://pbp.sph.com.sg/urbanapp2014. Shoppers now stand a chance to win 2-Day, 1 Night luxurious staycation and spa package for 2 at the Siloso Beach Resort Sentosa. 1To qualify, spend a minimum of $50 in a single same-day receipt. Purchases made at beauty, wellness and fashion stores at Parkway Parade will double your chances! 1Each shopper is limited to a maximum of 10 chances per shopper per day. Other terms and conditions apply. Visit our Customer Service Centre at Level 1 or www.parkwayparade.com.sg for more details. Publicist PR embraces the ever-­‐evolving role of public relations, marketing and social media in the retail fashion industry. Helmed by a team of fashion. PR and marketing experts who have their pulse on the industry, we've been dishing out the industry inside scoop since 2005 – making us practically indispensable to brands who want their have their stories told. We remain ever ready to be paired with clients desiring nothing short of a dynamic PR agency with great ideas and tactics to keep you outfitted for success.